With only one night left before voting begins for our British General Election, I notice that more and more people are beginning to open up and share their personal political views. Politics, along with Religion, are traditionally ‘no go’ areas socially, and at any other time we go about our lives mixing with all kinds of different people, largely unaware of their true political opinions. A general election is a time for contemplation & consideration. When friends and neighbours start voicing their political views it can sometimes shock but mostly confirm what we predicted of them. Businessmen & farmers or landowners were Conservative, teachers, writers and public sector workers , Labour, then any ‘rebels’ in between voted Lib Dem. 2010 saw a ‘rebellious surge’ and inspired by Nick Clegg’s impassioned performances the frustrated public saw a chance for change. Even I was so excited by the Clegg & Cameron No10 garden press conference. I was full of optimism for the future. To me it made since that we repaid our debts, I was confident that Nick would keep Dave in order and would stand up for the key Lib Dem values, a fairer society, no more nuclear power stations, and that oh so popular ‘Free university education ‘ . Along with the rest of the country, I watched in horror and bewilderment as the optimism turned to terror and disappointment. What next then? Thankfully last November I took my son ( studying Government & Politics) & a friend to see Natalie Bennet speak in Frome. 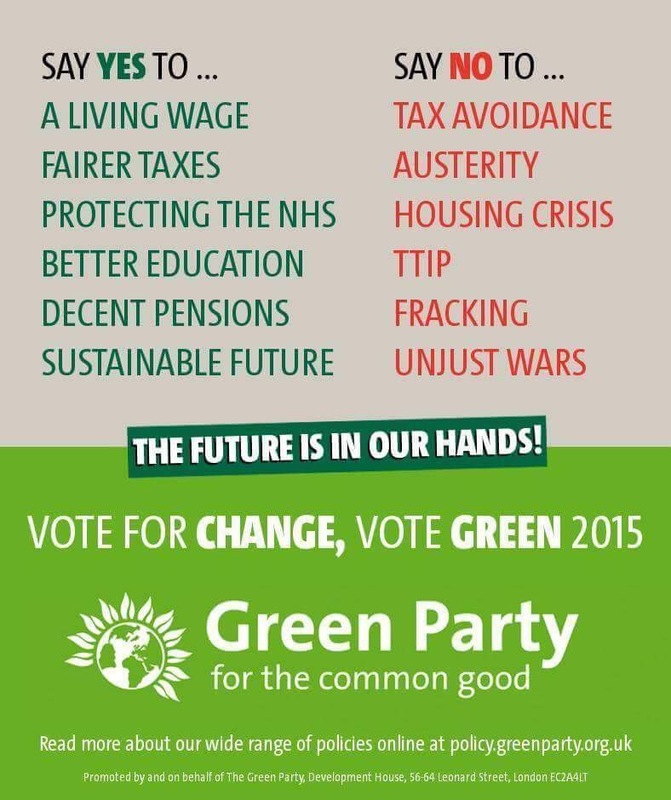 At that point the only thing I knew about the Green Party was that they were against Fracking and Nuclear. After my initial shock that Ms Bennet had an Australian accent, ( I really did know so little about her and the Party), I was astounded by her effortless recall of facts and figures. She spoke of her vision for the UK, and the World, and answered all the questions thrown at her in detail and also to the point. She had analogies that made the most complicated of political procedures simple to understand. Probably I wasn’t alone in thinking that Nick Clegg and his party had just given in to all the Tory demands, I didn’t know that an agreement called a ‘Coalition’ actually meant that you had to fully support the larger party. Poor old Nick had his hands tied. This was when Natalie was clear that no coalition agreement would be made, particularly with the Tories, by a Green leader. During the talk someone had asked if we had a Green Party candidate for our constituency, that’s when we were all introduced to Theo Simon. As we left Theo was chatting to us all and when I said I was from Castle Cary he asked if I knew of anywhere he could come and speak. I then had a project and a mission! Theo held a ‘Green Party’ information evening at The George Hotel in Castle Cary in March & the room was packed. Plenty of questions asked and answered and Theo even handled a drunk heckler with confidence and style! In my mind Theo Simon is the only candidate in my constituency that I trust to stand up in Parliament for what he believes in. He’s a listener and a speaker so I know he will speak for his constituents interest. Watch this and imagine him in Westminster! Political reform. The system is broken, corrupt and unfair. It needs to change and the Greens are determined to make that change. Fracking. I KNOW for sure, in my heart and blood that Fracking is WRONG. There’s plenty of evidence to back this up so I’ll leave it at that. 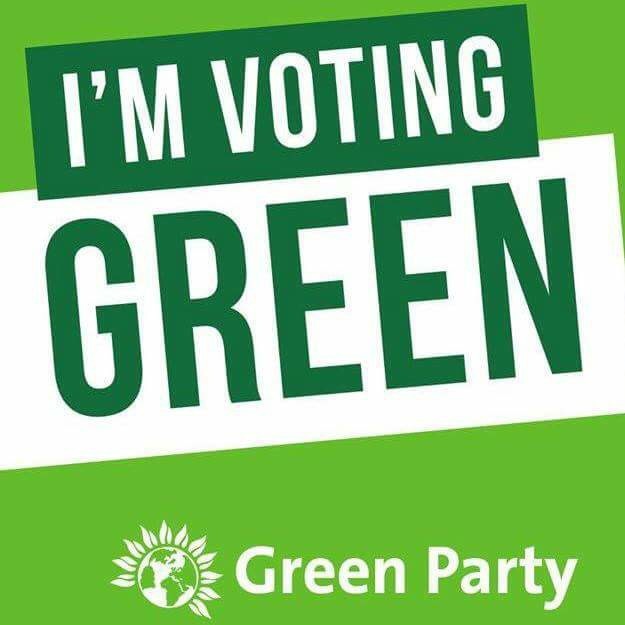 The Green party also know it’s wrong and will do everything they can to stop it. Nuclear Power stations. Again, as with fracking, I just KNOW it isn’t right for the planet, for the UK, and for my county of Somerset. I don’t want a new power station in Somerset. I don’t trust what happens to the waste and I don’t think we should leave it to our great great grandchildren to decide how to dispose of the waste. Trident. I could write essays on why we don’t need it, but the simple fact is that with all our National debt, it’s a ‘luxury’ we can’t afford. Before either we start a war or some terrorist or super power nuc us I’d like to think that as such a “wealthy” nation as ours should have all it’s people housed and fed. Immigration. I know I live in sunny, rural Somerset and so immigration may not be our biggest problem, however I do believe that we are human beings first all sharing the same planet. The immigrants I know and have met have all worked hard and we’d be hard pushed to cope with some of the hardships that some immigrants have gone through to just get to our shores. We really don’t know how lucky we are to live in a relatively peaceful country. Money. It needs reforming. The balance of wealth is wrong and unfair and I believe that we’re not being told the whole truth. Even the BBC have been impressed by the Green Party manifesto’s ideas about financial reform. Education. There should be a free option for all who want or work hard for it. Business. 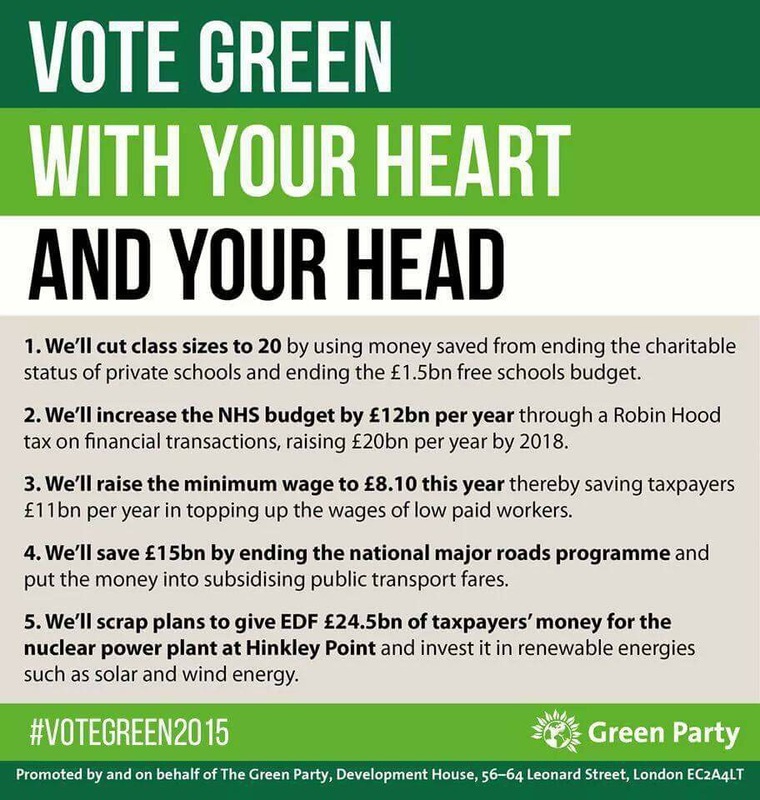 The Green Party is fully supportive of small businesses and enterprise. having had my own small business I have been all too aware of the power and corruption that comes with large monopolies. We need our small businesses, independent retailers and small farms. I’m a Beekeeper. The importance of protecting our wildlife, plants and pollinators. The environment is something we have no choice but to protect. Renewable energy. If other countries can manage with wind, water and solar power, why can’t we? Surely if Solar power can run Rockets in Space, surely we have the technology and will to run our energy needs here on Earth? I have been impressed by the whole of their manifesto and find I agree with 90% of it, which is far more than I ever agreed with with any previous party I voted for. I do hope that I am not the only one who will vote with my heart and head this time, no more tactical voting to give us more of the same. Lets have our peaceful revolution, good honest MPs that genuinely want the best for their constituents and their country. Lets vote for people that we’re proud to admit to support and no more of the supporting the least worst option.